It is not that bad now. I have briefly discussed many of the changes in the economic and social aspects of life in Russia over the last ten years or so. The economy is clearly better. I see nicer automobiles, more restaurants, bigger and nicer grocery stores. And people are friendlier. Okay, “friendlier” may be an overstatement. They are more helpful in the shops and stores. There is more pride in the appearances of buildings, lawns, and public squares or parks. There are still remnants, however, of the old days. In one of my earlier blogs I mentioned local bureaucracies. Anything to do with local government is frustrating. You can never be sure that you got all the information you need prior to taking your documents. But this is not just true of government offices. Today is a good example of what one faces here. We shipped one pallet of boxes from the US to Russia. We used a company that specialized in personalized, international shipments for some of our winter clothes and a few books. International shipping is expensive so we could not afford to ship a crate or anything large. We first were notified the pallet had arrived to St. Petersburg, then later told that it was still in Hamburg, waiting to be cleared through the customs. But we were told that the custom fees are four euros per kilogram, which DOUBLED the cost of shipping for us: something we were not prepared for at all! Had we been told that when we were getting the quote, we would not have shipped it and purchased what we could here. We were also given a mound of paperwork to fill out. So we contacted our shipping agent in the US and were told they updated us to an “express release” status, so we should not have to pay anything or fill in any extra paperwork. The response from the Russian officials to that was, “the Americans don’t understand how things work here.” I have a friend from America moving to Russia and she and her husband ran into the same kind of problem. You end up paying more than the cargo is worth. But the Americans companies do not disclose that information to you when you place your order. So after many emails and phone calls with the receiving organization in St Petersburg we finally had a list of papers we needed to take care of, the most important and urgent of which was the power of attorney that we needed to sign over to the director of the company, so that his people could start moving our cargo through the customs. This will enable them to handle all the paperwork to get it through customs and prepare it for our driver to pick it up and deliver it to Luga. I handled logistics at my former job and knew this requirement is not uncommon for international shipments. My wife called a legal notary, which is located not too far from our apartment, a couple of days ago to get our paperwork for the power of attorney in order. She was to receive a call back from the company in St. Petersburg handling our cargo giving her full information on their director – a requirement for the POA. The call never came and no one answered when she tried to call them. This is one dimension of Russian life that is so frustrating. Hours for those dealing with anything official are seldom posted and one never knows when they will be at work. No message is left informing you of when you can contact them. So Oksana decided to walk to the notary anyway, hoping the information she did have would be sufficient. However, contrary to what she had been told earlier, they said she had to have more information to allow them to notarize the power of attorney. Their computer system is automated now and they have to have all necessary information for their computer to allow them to print out the POA form. They need the director of the company’s passport number, his date of birth, license number and a few other details. (As an aside, all Russians have to have a domestic passport. This is just like a regular passport, but it shows you are legal in this country. It functions somewhat like a driver’s license in America except you are required to have this picture ID with you at all times.) So she had to walk home, contact the transport company, get more information from them and walk back to the notary. In the meantime I’m stuck in our apartment waiting for the computer technician to come and upgrade our internet with a wireless access. After much investigation we realized the router we brought with us from America was too high-tech for Luga, so we couldn’t use it here. So Sergei, our computer guy, will come and put in an old spare router he has “hanging in his trunk” until Luga modernizes, which is supposed to be in two months. And then he’ll take his old router back and we can use our own again. He said he’ll charge us five bucks for BOTH, his visit and the “rent” of his old router, by the way! This may not be a normal day in Russia, but it is not an unusual day either. Anytime something comes up that requires more than one office of any kind getting involved you need to count on confusion and more than one trip. In the old days you could handle it much easier. As I mentioned in my second blog, bribery was common. Back in 2007 when we went to Moscow to get our marriage license we checked the web-site, got all our information, and arranged all our documentation. We went to the American Embassy. They looked at our documents, and a Marine staff sergeant asked me to raise my hand to certify all I had written was true. I confirmed it and we got our American approval and left. We then went to the Russian Office of Foreign Ministry. It was very crowded. We got in to see the official about 11:45. He looked at our paperwork, said everything is in order, come back in five days and he will have it ready. “Five days!” I said. “The web-site said 1-2 at most.” He replied, “The web-site is not correct.” I said, “I can’t afford to stay in a Moscow hotel for five days. And I have job in St. Petersburg I have to get back to.” I received a very blank and unsympathetic stare back. My wife leaned over the desk and now spoke in Russia (we had been speaking in English), “Can we come to an agreement?” He turned to me and said (in English), “Yes, you give me one hundred American dollars and I will have everything ready after lunch.” So I gave that man $100, we went to grab a bite to eat, came back, picked up our paperwork, and left for St. Petersburg. My Facebook friends know that after I wrote the above I had an accident. My wife was pulling out a plastic folder of documents from the desk at which I was typing and somehow hit me in the eye with the plastic document. I never saw it coming and did not blink. Pain seared through my eye to my brain and back. After two hours of horrible pain we decided we needed to do something. The pain was getting worse. She called her mom, who made some contacts. Turns out there was a “Polyclinic” around the corner from us we did not know about. We had to take a taxi because I could not walk. They said the eye-doctor was there but preparing to leave. By the time we got there he was gone. The reception lady immediately looked me over and assured us she’s had “experience” working with the eye doctor. So she wrote down the name of a cornea crème to relieve pain and promote healing. It was an OTC drug (a lot of them are here). We went to the nearest pharmacy and paid $6.50 for the crème. Actually we didn’t have the correct change so we paid less. The clinic charged us nothing. As we were walking back to the apartment Oksana said, “So what do you think it would cost in America to go to the emergency room after working hours without any insurance?” Several hundred dollars to be sure. It was an awful experience. We paid a dollar and a half for a taxi and $6.50 for special eye anointment. The day went horribly in general. So do days in Russia like that leave me discouraged? Yes. The laziness and lack of accountability in some “official” workers is more than frustrating. Why don’t you write a note on the door when you will be there??? But through all these negative experiences no one was trying to exploit us. Even the folks at the shipping/customs office have a set price that most international shippers just do not tell you about. We got our power of attorney documents sent 90 miles for $12.00 (some university student volunteered to do the courier job to make a little bit of money). The paralegal notary charged us $30.00 to notarize all our POA documents. I really do not want to turn my blog into a political commentary, but the underside of capitalism is showing through these days in America. It is not that these things are a “bit cheaper” in Russia. There is no comparison. I will say what I think of health care: the Obama health care legislation was the most heartless piece of legislation I have ever seen. It essentially left us with no health care after one year. We, as lower middle-income folks were left to the greed of both government and huge health care organizations. Some of my friends will say that this points to the positive aspects of socialized health care. In Russia there are two “tracks” of health care, social and private. Private is more expensive and generally better. For problems like mine, the public health care if far better and obviously way cheaper. But Russia went through an awful time after Communism fell. People learned to get by as best they could. A lot of them also learned not to exploit each other. The problem with the system in America is that the greed and selfishness are so deeply entrenched that no system works well. It is not “socialized health care” when you have to pay an arm and a leg to the government for care you still have to pay for at the doctor’s office or emergency room. Our government pretends that if they take a lot of money from us then that makes it socialized health care. No, it makes it exploitation. The positive side of American health care is that in a real emergency you have firemen, medically trained first-responders, and many volunteers who will be there in an instant. You don’t have that efficiency in Russia. If my eye had been seriously damaged then in America a qualified ophthalmologist would have come immediately. The health care workers in America, as far as I can tell, are among the best trained anywhere and are quite focused on being helpful. My complaint is that government and health care corporations have corrupted it. But that is a part of my “Distributist” mentality I suppose. So, yeah, it was a bad day in Russia. But from where I’m standing the horizon looks better here. Inefficiency and irresponsibility in details can be fixed. I’m neither “a prophet, nor the son of a prophet,” but the systemic flaws and greed in the American system will take a lot more work. My own hunch is that the cloud on the horizon is not dust being created by a brave and selfless Lone Ranger who will save us come November. In my last entry I engaged in some preliminary considerations of politics. I decided to take on the area of religion as well. For some of you a discussion of religion is at best tangential to Russian/American relationships. Maybe it’s tangential to a lot more than that. On the other hand, the two countries have strong religious backgrounds. And, yes, I am aware of “don’t discuss religion and politics.” But before I look at the differences between the American and Russian expressions of Orthodoxy, I think some background for what undoubtedly colors my observations is in order. I do not write as a “cradle Orthodox.” I have never gone through any Orthodox schools. My understanding, as I will point out, has been shaped by readings, catechumen classes, and conversations with priests and others who helped me understand it. So we’re not talking expert analysis here. I was raised right in the middle of the Bible belt of southern (American) religion. My dad was a Baptist preacher. Most people in that part of the south were Baptist. Dad’s views were, well, very conservative, but according to Jerry Falwell’s definition of a Fundamentalist, dad was not a Fundamentalist. As is commonly known in these circles, Falwell responded to a reporter’s question on the difference between a Fundamentalist Christian and a conservative Christian: A Fundamentalist is a conservative who is mad about it. We were not mad about everything, but we did protest. That is what Protestants have done for centuries. In my early small town childhood churches, we couldn’t be like Luther and protest against Catholic hierarchy because there wasn’t one around. We couldn’t protest against the Lutherans because we didn’t have any of them either. We could’ve protested against the liberal Episcopalians, but you had to go to Greenville to see one. So we Baptists protested against the Presbyterians because they didn’t believe in free will. Then we protested against the Methodists because they did believe in it. After forays into other faiths and no faith at all, I ended up right in the middle of Baptist life. I am frequently asked why I left the Protestant faith, particularly the Southern Baptist denomination in which I was trained and taught. I mean, I actually made a living teaching in a Baptist University. I did not leave because I was mad about anything. In one of those seemingly random purchases I bought a couple of books containing some really old writings and reflections by Greek and Russian Orthodox writers. It was a bad time in my life. I was no longer the man I wanted to be. It was, in the words of Kris Kristofferson, “back when failure had me locked out on the wrong side of the door.” Self-help, devotional books, pop psychology never did do anything for me. The writings of Theophan the Recluse, a Russian monk (1815-1894), had a powerful impact on me, however. It seemed like he knew me. Then there were others. I had absolutely no contact with any actual living person who was Eastern Orthodox until after I had “met” a lot of dead ones. Scripture and Christian history for them seemed a consistent stream of divine revelation, not points to be argued about. So I then started reading some Orthodox writers who happened to be still alive, chief among them Kallistos Ware. Now, I had read a lot of theology in my seminary days. The first thing that struck me about Ware was he wasn’t arguing with anyone. He did not set forth a bunch of views, evaluate the positive and negative features of each, then qualify the terms until they died the death of a thousand qualifications. He wove together Scripture, church councils and traditions, and the teachings of the “elders” in a way that seemed seamless. The freedom of Protestant thought has opened the door to a lot of different and differing views. Because there are so many variations of “Protestant thought,” one has to qualify terms, clarify presuppositions, and the like. A lot of different people with very different ideas become Protestant. What became clear to me in my classes and conversations on becoming Orthodox is that they stuck with the first eight ecumenical councils of the Church. If you could not hold to those, for whatever reason, then you do not need to be Orthodox. There is no pretending and there is no exalting of the view that one person’s opinion or interpretation of Scripture is as good as another person’s. So as far as I can tell at this point you do not have a “liberal Orthodoxy,” or a “social gospel Orthodoxy,” or a “fundamentalist Orthodoxy.” Some, no doubt, see this as a vice and others as a virtue. But the parameters are there when you come into the Church. After sneaking off and attending Vespers and then Liturgies at a local Orthodox Church, I began to see worship differently. In my Protestant world, worship was focused on how good the music was or how good (or long) the sermon was. If one had an inspiring time then that meant the worship was good. This approach was corrupted by not a few who “planned” worship around what would be most liked by the most people. Of course, the rationale was you could win more people to Jesus that way. Being privy to some behind the scenes discussions led me to believe that was not always, or usually, the motivation, however. Along came the “worship wars” between Protestants who preferred old hymns with an organ and piano and those who liked new songs with guitars and drums. “Old” is a relative term, however. They did not mean old in the Orthodox sense. “Old” was in the sense of what two generations ago sang. When I went to the Orthodox Church there were no instruments. What they were doing was not clear to me, but what was clear was that they weren’t doing it to please anyone or entertain anyone. There was a homily in the middle of the liturgy, but for the most part it was completely directed toward God. I felt that approach strangely attractive. I say strangely because there were other aspects of the liturgy that were, well, different. First, when you enter the place where you worship (the nave) you are facing the icons and the altar. Things looked a lot different from my childhood churches which had that pulpit, choir area, and then the baptismal with a picture of Jesus by the river painted on it. (I won’t go into the “preacher’s chair” behind the pulpit.) Second, you stand during an Orthodox service. There are a few pews in the back if you need to sit. But most stand—for almost two hours. You are in the presence of the King of the Universe after all. There was also a “laid back formality.” It is a formal atmosphere in that a liturgy is followed, but because you are standing if someone needs to leave or take a child out it is not a disruption like getting up when you are sitting in the middle of a pew and stepping over everyone. There is an altar in the church, but it clearly is not like a “stage” as it turns out to function in most Protestant churches. You don’t really see the choir. The building where the Orthodox Church worshiped where we attended in South Carolina had been converted from a Methodist church building (I think). There was an area to the side where the choir assembled, but I could never figure out where the boundaries for choir and rest of the congregation were. The priests move around up front at the altar, but clearly there is no hint that one is “performing” a song or giving a performance as part of the liturgy. My family followed me there and after two weeks then six year old Gabriel summed it up: “Dad, I REALLY like this Orthodox Church.” I figured if a six year old sensed it then it was time to make a move. Since I was raised in such a devout Baptist home and my wife was raised in such a devout Communist home, neither one of us knew what to do or when to do it. There is a “physicality” to Orthodox worship, that is, you cross yourself, you bow, and sometimes you prostrate yourself (repeatedly)—and I’m talking actually all the way to the floor. Some of the congregants were brought up in the Orthodox Church. Others were not. Most all of them realized, it seems to me, that there is a good chance that visitors may have come from a Protestant background. So there is a certain freedom. If you don’t cross yourself at that expected time or if you have to mumble the confessions of faith or the prescribed prayers in a way that it becomes obvious that you are really just mumbling in general because you do not know the right words, no one stares at you. Or if you keep shifting from one foot to the other frequently or groan in a slightly audible manner about an hour and fifteen minutes into the service they are okay with that. They know eventually you get used to it. Now, the move to Russia is demonstrating to us the variations within Orthodoxy. The small town Baptist from America and the small town Communist from Russia are learning about how Orthodox faith is both the same and different in the two “worlds” of Russia and America. That discussion is for a later time. Obviously when an American talks or writes about Russia then political questions get asked. I decided a few preliminary thoughts need to be written. I intend to write a fuller explanation of how I see things later. I am waiting for at least two reasons: First, I had my books shipped by boat so my modest Russian library has not arrived yet. I cannot document statements I will need to make. Second, I want to be here in Russia a bit longer and talk to more people on the subject before fully addressing the issue. I started thinking about writing some ideas yesterday after I read an article that popped up on my Yahoo News feed. The article was, “Putin’s Russia is a Poor, Drunk, Soccer Hooligan,” by Scott Gilmore of The Boston Globe. It was an op-ed piece, but if one offers opinion then it ought to be an informed opinion. This guy slaps together some isolated “facts” or statistics and draws hard, fast and unfounded conclusions. The author gives no indication of ever having been to Russia or, if he did come, having learned anything. He shows no awareness of authors who have devoted their careers to understanding Russia. Can this kind of article become what qualifies as important political journalism in America? The article was trash, but it gets on the major news feeds and many consider it a source of information. I do not offer these “preliminary considerations,” therefore, as expert analysis. I write as someone whose main hobby is Russian history and politics and who has actually lived here and has family who are Russians. Certainly when the subject of contemporary Russian politics comes up the first name that gets “front and center” is Vladimir Putin. He elicits strong reactions from most people—either positive or negative. Last year I read about four books on Putin in addition to some of his speeches going back to 2000 when he became president of The Russian Federation. I lived in his hometown of St. Petersburg, Russia for three years. I still find the man a mystery. But I will offer the following statements and elaborations about him, with the caveat I am still researching. First, Vladimir Putin loves Russia and is strongly committed to whatever he believes is best for Russia. I think it was Marin Katusa who pointed out Putin simply does not care what the Western press says about him. He is not running for America’s “Most Likeable Man.” I think that irks the American Press Corps especially who are so used to everyone panting after their approval. I think Putin’s recent exchange with CNN’s Fareed Zakaria also shows he is smarter and more well-informed than most of them as well. Second, I do not think there are many leaders today who work as hard as Putin. He has been accused of having affairs with a number of women, stowing away millions in cash, and chasing tigers all over Russia. The truth, I think, comes from those closest to him (including those who do not really like him) who say he is extremely driven and hard-working, and they do not see any evidence of all these wild rumors the Western press and readers love. Unlike our President in America, he does not go on lightweight talk shows or spend hours watching basketball games. The first press conference I saw in Russia shocked me. He was there for at least three hours answering very difficult and complex questions. I had never seen a politician expose himself to such intense scrutiny and difficult questions. There is no teleprompter. Were the questions screened? I suspect maybe they were, but I don’t know. I do know he still had to do a lot of homework to answer them whenever he knew about them. Obviously, he does work out and still enjoys Judo and Sambo. Third, a part of the mystery of Putin is his complex background. His father was a war veteran and atheist who became a leader in a local Communist Party group. His mother was a factory worker who was an Orthodox Christian. Putin had two brothers to die before he was born—one infancy and one later from diphtheria I believe. Putin’s mother slipped and had him baptized as an infant. Somehow the marriage of his parents stayed strong despite the ideological differences. Putin loved spy movies and was inspired to join the KGB and served in East Germany. But he says he never quit wearing the cross he received at his baptism. Once he was in a sauna and the furnace caused a great fire. Everything was demolished and Putin and a friend escaped with no clothes. Later a fireman who had sifted through the ashes gave Putin the cross back. Putin says he had no explanation as to how that little thin metal cross survived the fire that destroyed everything else. He decided he would not take it off. Now, I am one of those cynics who does not believe you can ever know a politician’s true religious convictions—at least while he or she is in office. It does seem to me, however, that Putin attends church regularly but not in a way that draws unnecessary attention to it. He considers himself an Orthodox Christian. He has devoted a lot of government funds to rebuilding monasteries and churches destroyed or severely damaged in the Stalin era. My point is not to convince anyone what a great Christian Putin is. My point is that the casual way he is referred to as a KGB agent by Americans, as if that were the sum of who he is, is misguided and simplistic. It is a convenient way for Americans, especially politicians, to indicate he is a bad person. Putin is liked by most Russians as every poll taken finds. He is not liked by all Russians, however, some of whom are my friends. As I said, I’ll reserve a final evaluation of the man after I have studied him further. But I know both from reading books written by writers I trust and my own experience of being here two years after he became President and being here now that Russia is a lot better off economically and in many other ways as well. Now an observation about Russians and politics in general. During my first visit here I was in a small Russian village and got involved in a conversation with an older babushka (literally “grandmother,” but the term is bigger than that). She was denouncing America for its horrible bombings and assaults on other countries. So I simply said, “So you don’t like us Americans?” She gave me this quizzical look and then responded, “Of course, I like you. Americans come to our village every year, and they are all such nice, caring people. I have never met an American I did not like.” She then added that important phrase, “I don’t like America; I very much like Americans.” The next day in the same village I gave a talk on why I moved from being an atheist as a young man to believing in God. I set forth a few scientific and philosophical tidbits that had changed my mind. There were very few people in the open building. There was one white haired Russian man who stood in the back. Later, when I was outside, he came up to me and, through my interpreter of course, told me that he was a life-long Communist and atheist. But then he told me he thought I expressed my thoughts very clearly and very well and he would give them more reflection. He then kind of smiled and said, “You do know the early Christian believers were Communists, right? The Bible says, ‘they had all things in common.’” With that, he smiled again, shook my hand and left. I relay those two incidents to show how I learned to avoid the easy stereotypes of Russians. If I use words like “anti-American babushka,” or “old atheist, Communist Russian,” one would draw conclusions far from the truth of who those people really are. In general, I think Russians are far more open-minded and far more willing to listen to different ideas without jumping to conclusions than most of us Americans. Of course there are exceptions! Nevertheless, I think there has been a general trend among Americans (myself included!) to listen just to sound bites and take short cuts to thoughtful reflection. It is important that we focus on real research and have meaningful discussions with people who come from different perspectives than we do rather than promoting the kind of trashy journalism that comes from people like Scott Gilmore. This installment on small town Russian life will be on a very practical part of life here. We went shopping AGAIN today. I have always hated shopping. I fit all those stereotypes of men who will do anything to get out of it. But since we do not have a car and we have to hand carry everything back to the apartment that would require full family participation in this endeavor. There are other factors involved in the inability to get it all in one load, however. There are not only no Wal-Marts, Sams, Costcos, etc., here in Luga, there is nothing close to them in size and variety of offerings. Further, even though Oksana was raised here she still does not know exactly what each store has at any certain time. You go in, you look around, they may have what you need in there or they may not. They may have what they had last week or they may not. I have not yet figured out why one store carries all the toothpaste and toothbrushes you could ever want, but the toothbrush holders are sold at another store a kilometer away. That store does not stock toothpaste, however. Most stores here, unlike, say in St Petersburg, are relatively small. They pack in the merchandise usually. In one store we went in and turned around and left simply because it was so crowded with “stuff” and people you could not move comfortably. We are both use to having our space in America. The merchandise was from floor to ceiling with barely any room to place one foot there. So every day I revise our “need” list. I feel great if we get five items off in one day. There is a whole different social psychology at work between customer and “shop assistants” (common British English translation, widely used by students of English here) in small town Russia. They are there if you really, really need them. They don’t jump you with “How may I help you?” the minute you walk in the door. For example, when we finally found (after three days) a potential cup that could be used as a toothbrush holder, I stood back and watched. Oksana looked it over. Most items are behind the counter in these smaller stores. That is not true of all of them, especially if they stock large items. But in stores with small items most of them are behind a counter. So you have to look at them from the other side of the counter. The shop assistant was eyeing Oksana, but did not speak or come over. No violating the privacy of the customer. Okay, I’m the observant American, so I don’t know. But it seems to me like the shop assistants consider it rude to try to force you into a purchase. So she waited until Oksana requested help. Then she came promptly and showed her whatever items she wanted to look over. We also purchased (from another store) a coffee maker, lamp, and a hair dryer. When you purchase an electrical item the shop assistant removes the item from the box, plugs it in and makes sure you see it works. Even with the lamp she went and got a light bulb to show us it works. We shop for groceries at Magnet, a chain store in Russia. They have modern electronic check out computers. In a lot of the small shops they still use a calculator. They enter the cost and show you. Then when you pay they show you the amount you gave her minus the cost and what your change is. In most stores they also write down the purchase on a separate sheet including how much you paid and how much was returned. I assume that goes to “the boss” or the accountant. Every ruble is watched. Or maybe this keeping of the books is just another expression of the Russian love for paperwork. They are not big on receipts unless you request one, however. Mostly, we just pick our stuff up, stick it in a backpack and we’re on our way. Also, the price you see on the shelf includes whatever taxes are involved. You pay the amount you see on the product. I am amazed at how much I like that! When we shop for groceries the amounts of the packaging are in general much smaller. For example, I’ve never seen even a half a gallon of milk. Certainly nothing like the two gallons at a time we used to buy in America. The stores are, in general, much cleaner than when I was here years before. You have all these shop assistants with brooms or mops keeping the floors nice. Russia can be, well, dirty. Not every road or drive is paved. It snows a lot in the winter and rains in the summer. It’s dirty. But there is obviously a much stronger intention of keeping things as clean as possible. They don’t really ask you can they help you, but they will sweep up the dirt you tracked in pretty quickly. I’m sure someone is watching for shoplifting, but I just don’t see them. I go in most stores with a backpack on, and Oksana is wearing or carrying a large ladies bag as well. No one has ever asked me to take my backpack off and store it in a locker. In addition to the chain stores, there are many smaller shops that have fresh meat, veggies, etc. The prices are a little higher sometimes, but they are very convenient. I would not call them “convenient stores” in the American sense because they are much smaller in size. Likewise, the “larger” grocery stores in Luga are not close to the size of, say, a Publix or Ingles in South Carolina. You could probably put four of the stores I shop in inside one of the Publix I shopped in in South Carolina. Another difference I have seen from the first time I was here is that they have more “processed” cereals, candies, and ice creams. Now, they do not have near as many as American grocery stores where you see almost the whole aisle with different kid’s cereals. It is still a very small section in a small store. But I sense things are changing. The preference remains for oatmeal, “grechka” (buckwheat), and other whole grain cereals, however. The other items we shopped for were drug store items. As with the other stores, you do not have anything to compare with CVS or Walgreens in size. The standard “apteka” is very small in comparison and much more limited in what you can find there. You go there to get medicines and a few other related items of personal care. There are very many of these small stores here in town. The set-up is the same as with most small stores. All items are behind a counter, only the apteiki we’ve been to here have glass plates extending to the ceiling as well. You can’t “reach over” the counter. You go to the designated place and tell the shop assistant what you need. Of course, you can ask advice or availability or options. Then she—usually it is a “she”—goes and gets the items you requested. Of course, some things we want from a pharmacy are rather personal. Too bad; get over it. You have to ask! So shopping requires that you be more intentional than just writing out that lists and being assured you’ll find everything in one or two stores. You plan, you ask around, and you try to remember what you see in each store. I guess that is why I have to admit liking this aspect of shopping in small town Russia: it’s a challenge! Finally getting to knock something of that list just feels really good. Hey, it took a lot of hard work! The most frequent question I get from my American friends is, “What is it like living over there?” Or, as one friend put it, “Do you really like it over there—I mean, better than living in America?” Living in a small town in Russia, like living in a small town in America, has good points and bad points. HOUSING. We live in an apartment that is much smaller than our home was in America, and there are not as many conveniences as there either. We will get a washing machine soon, but they are smaller and dryers are not commonly used. They still hang out clothes here. There is no air conditioning in our apartment. You can get window units, but the summers are so short and the winters are long. It’s just not worth it. It does get hot, but not as hot as most places in America (like South Carolina! ), of course. It is June here, and the temperature is still very pleasant. Our refrigerator is much smaller. We live close to several grocery stores, so we just make more trips. We don’t have a car—at least not yet. But there is more public transportation here than in American small towns by far. We can use the buses, “marshrootka” (a van large enough to carry things on board that goes on a particular route), or numerous readily available taxis. On the positive side things are generally far less expensive. I mentioned on Facebook that our internet is for unlimited minutes and with very fast service for $6.50/month. Our apartment rent is about $200/month. The cell phone service for my i-phone (with unlimited internet usage as well) is also $6.50/month. The down side is you cannot handle things over the phone. You have to go to their office. There is a lot of paperwork that has to be filled out. Groceries and everyday items are also much cheaper. We bought a shopping cart full of groceries for about $25.00. The starting price for a nice washing machine and refrigerator is under $400.00. Dishwashers are available, but most Russians in our small town do not have them in the home. FOOD. It is easier and cheaper to eat healthy in Russia. The general attitude toward processed foods with chemical preservatives is much more generally negative here. In America it is much more expensive to eat organic or healthy foods. Here that is not the case. GMO foods are illegal in Russia. Putin made that clear last year with his statement, “We will not poison our people.” The FDA in America apparently does not concur. They still have the equivalent of a farmer’s market in downtown Luga. Fresh fruit, vegetables and meats are plentiful there, and the prices are very good. These fresh foods are usually sold by the “Caucasians” at the market. (The word “Caucasian” in Russian is very different from how it is used in American English. It means someone who comes from the Caucasus mountains or region.) Food is tastier without all the preservatives in my opinion. They do have some places you can get “junk food” like pizza, etc., however. Unlike in St. Petersburg, there are no McDonalds or other fast-food hamburger restaurants here. Also, medicines are so much more affordable here. For example, I take omeprazole for acid reflux. In America a month supply cost over $20.00. Here I paid less than half a dollar (27 rubles) for 30 pills. Also, more medicines are available over the counter here. We try to avoid antibiotics, but they are available over the counter if you have an infection requiring them. Doctors also still make house calls, and they are more likely to start with recommendations of alternative natural treatments to their patients. Overall the lower prices on food and lodging means if you do have a stable source of income there is not the high pressure of American life. It was a big attraction for someone like me looking for early retirement. Most people in the world, including Russians, view Americans as mostly wealthy. That is technically true. Compared to most of the world Americans are in general much wealthier. But that is a bit misleading. It simply takes a lot of money to live in America for a family of five. The cost of a house or apartment is extremely high. Even during the “recession” of 2009 and following, grocery cost did not go down. Having cars to get to and from work in our small town was a necessity, not an option. For people in small towns in America public transportation is not as readily available. For our family, we decided some of the inconveniences of a smaller living space and having to walk or take public transportation were worth the exchange for less financial and time pressure. CLOTHES. Clothing in general is just as expensive in Russia as in America. Russians, especially the women, are very style conscious. Even in a small town like Luga I see young women with these really high heels that leave my baffled as to how they can actually walk in them. The clothes are much more typically Western looking than when I first came here. There is even a shop here in Luga with the word “jeans” (in English) as the name of it. In general you see a lot more signs here these days that have some English names in them. Many of the road signs have both the locations written in Russian and also transliterated into English. DAILY LIFE. As I mentioned we do a lot more walking than we did in America. Most people do. What was more striking to me is the number of children who play, ride bikes, and play ball or other games outside. In our neighborhood in America we didn’t see that many kids playing outside or riding bikes. Our seven year old son is already asking to go outside more. He likes getting out! We are careful because he only knows English, but generally speaking people do not have the same fears that people of evil intent will harm children as in America. It is a lot more like life was when I was a child. The kids play outside till mama calls them home. A major difference I have noted in Luga from the time I first came here is that the playgrounds are much nicer now than then. I have seen several already and the equipment is relatively new and clean. Further, some playgrounds I have seen have exercise equipment (the equivalent of gym machines really) as part of the playground equipment. Obviously there is an attempt to help children exercise and become healthier. Our son Gabriel loves getting on that equipment. A negative of living here, however, is the dangerous driving. I mentioned it in an earlier blog describing our trip from St. Petersburg to Luga. Since we walk with our children so frequently I have found the driving in downtown traffic very disconcerting. I spoke with a local resident about this and he said the accident and mortality rates are very high even in small towns like Luga. He believes it will take some time before there is a cultural shift to safer and more courteous driving. Another inconvenience is the absence of fresh drinking water from the tap. You have to either buy bottled water or get the water from someone who has access to a fresh water supply, usually an underground spring. These springs are rather common here. Therefore, the refrigerators do not have ice makers. You have to put clean water in the trays and freeze it that way. Of course, after the Flint, MI water catastrophe I am less certain about some supplies of water in the USA. BUREAUCRACY. The amount of paperwork involved in even simple transactions is, to an American, ridiculous. For example, when we went to the store to get our internet service I lost track of how many pages had to be filled in and signed, and the lady HAD to stamp the front and back of EVERY page! There must be some intrinsic pleasure for Russian clerks to stamp paper. They seem to do it with a certain vigor and seriousness. The amount of paperwork required to get Russian visas for me, Gabriel, and Marina Grace was terrible. Of course, we also had to get citizenship papers and passports from Homeland Security for Oksana and Roman. But none of that was as challenging as having to get the Americans in the family (Marina Grace, Gabriel and myself) “registered” with the Federal Migrations Services here in Luga upon our arrival. You have to fill out all the forms and take them to the local FMS office to be registered. First, the hours of local government office are capricious. You do not know when they will be open. One day it was 11:00 a.m. and another day it was 2:00 p.m. Sometimes they’ll decide to have a random “maintenance day” and there is no way to know ahead of time they won’t be open on that day at all. Then if there is a typographical error or any minor mistake (or even just correction!) the paperwork must be completely filled out again and resubmitted. For example, Oksana put that we are in the “Leningrad Oblast.” “Oblast” means something like “county,” only bigger. The application was rejected because they said the word “oblast” was not necessary. So she had to fill it out again and return to the office at a later date. One remnant of the Communist era is that the local apparatchiks still cling tenaciously to their power. So if you’re really big into creature comforts and have to have the room temperature the same all year round and must have your fast food available a short drive away, then Russia would probably not be the place you would want to settle down. Maybe keep it to just a short visit! But if think you would prefer simple, more basic living, then it is not a bad life at all. Today we stopped at a kiosk to get a map. The lady heard me speak to Oksana and asked her what language I was speaking. When Oksana told her I was speaking American English, she smiled and said that was the first time she had ever heard American English spoken “live.” Since we have both Russian and American friends I sometimes forget that most of the people in both countries rarely hear each other “live.” So I thought I would write some observations we have noticed over the years on the cultural differences between Russians and Americans, particularly those who live in small towns. I would add three caveats before I elaborate on our observations. First, I use the term “Russian” because that is where I live. I have noticed some of these characteristics in other Eastern European people as well, but I’ve never visited other former Soviet Republics. Second, I again remind you I’m talking primarily about small town life. I lived in Saint Petersburg three years, and I think a lot of what I say would apply there as well. But if I had moved from New York to Moscow, for example, my observations could be very different. But that is not the purpose of this blog. There are plenty of blogs written by Americans in St. Petersburg or Moscow. Third, all generalizations are flawed to some degree, because there are always exceptions. Nevertheless, I think it is extremely important to know something about the cultural “lens” through which people in other countries view reality and life. The differences are very real, but I know some Americans who remind me of Russians! And vice-versa. So with those “disqualifications” I’ll list and discuss some differences. First, a lot of observers have noted the differences in the use of a smile between Russians and Americans. I heard about three reports from American reporters at the Sochi Olympics who talked about how unfriendly and even rude Russians are. It is a common reaction. In general, Americans smile for pretty much no reason other than a greeting—especially in small towns. We smile and nod at strangers on the street. Clerks in stores smile when we walk in, and we smile back. In general, Russians don’t smile if they don’t have a reason. If you smile at them they think they are supposed to know you. What those American reporters did not understand is that to smile all the time while you are working indicated to some Russians you don’t take your job seriously. A worker is there to do a job. Smiling about nothing is not a part of the job. This leads to another difference—how we understand friendship. In America I have a lot of friends. Friends are people I know, have worked with, went to school with, socialize with, got to church with, or who took my classes when I taught. Americans in general are friendly. But if I really got in trouble and, say, ran my car off the road at 2:00 a.m., there are very few of those I would call. They are my friends, but we’re not that close! Russians tend to be suspicious at a first meeting. I think it has something to do with the imprint of the Stalin era on a culture. They “size you up.” They look at what seems like every detail of your expression to “read” you. I suspect it is even more pronounced when they know you are an American. I told my wife one time that I think every Russian is a closet psychoanalyst. When they do see you as a friend, however, there is nothing they would not do. You need to borrow money? They’ll come through. You run that car off the road at 2:00 a.m., they’ll come and help. I first came to understand this tendency in a guy I met here I’ll call Vladimir. We had met through mutual friends. He liked practicing his English with me. So we got together several times. At the end of one of our meetings he said, “Hal, I’ve decided you are a good man.” It seemed like a weird thing to me at the time. But over time I have realized he was saying he could trust me as a friend. Sometimes the “evaluations” are humorous. Yesterday my mother-in-law called apologizing for the awful expression my father-in-law had on his face when they came to visit. He was frustrated we were not ready when they got here. But, frankly, neither I nor Oksana thought anything of it. But she made it clear to us she jumped him because his expression was not acceptable. Russians notice everything. If the button on the sleeve of my shirt is missing they will notice and they will say, “Do you know that button is missing?” It amazes me sometimes the things they pick up on. Of course, when you’re married to one you just get accustomed to it. This attention to detail is linked to an incurable curiosity usually. When we got in the car for Mikhail to drive us from the airport his first question was why we came to America. We explained I had taken early retirement, and we really could live on that in Russia with no problem. He held his question as long as he could, but I knew what was coming. He leaned over and said, “How much is your retirement pay?” Now, he’s been around Americans long enough to know we’re a bit touchy on this subject so I guess he thought he would soften the blow: “I’ll tell you how much my retirement is if you’ll tell me yours.” I’m serious. He said that. On my first visit to Russia I think I was here two days before someone I hardly knew asked me how much my salary was. So if you are an American planning on coming to Russia then get ready. You probably will be asked about your money. It does not stop with salary, however. Russians want details on motives, intents, feelings, etc. As an example I’ll use our move to Russia. My American friends and family wanted to know why we are moving. But it was usually as a comment. Some said, “Well, if that is where you and your family will be happy I understand.” Others, mainly my close Protestant friends, would say, “If that is what God is leading you to do, then I understand.” Still others displayed the old American lust for adventure: “Man, that will be exciting! I envy you!” Russians can’t let it go with such generalities. What exactly was it. And, frankly, most boiled it down to money. They just knew the financial angle was the main consideration. Not a few of our Russian friends seemed frustrated that we could not give a specific, TANGIBLE, reason why we moved. Now, the truth is there were several factors at work in why we moved here, but I can’t just go into all of them in a brief conversation. I will write more about why we came here in a later blog. My point here is to illustrate a difference in the way many small town Russians and many small town Americans process the information. There was one other difference that came to me as I studied how Americans and Russians responded to our move. Russians were more confused by it than Americans. At first this reaction seemed odd to me because, frankly, most Americans still believe the greatest place in the world to live is America. That is changing. The small town Americans we lived around are completely baffled at what is happening in our country. It is more divided than we have been in some time—racially, economically, religiously, and politically. Many small town Americans sense that the values that were passed down to them are no longer to be honored in our country. I see the opposite trend in Russia. After the collapse of the Soviet Union, Russians were stuck with Boris Yeltsin. When I first came to Russia there was a kind of cultural confusion and, in some cases, national shame. Certainly the mood was depressed to say the least. What they had been taught and dared to believe for seventy years had crashed. Then came Yeltsin. But, as Gleb Pavlovsky observed, “Yeltsin did not build a government; he led a revolution for ten years.” The cure was worse than the disease. At a New Year’s party one year my dear friend Sasha offered the wry observation that, “it is a good thing that life is hard in Russia; otherwise it would be so boring.” It is very important to most of us Americans to keep up the appearance that everything is great no matter what. From Richard Cory to Robin Williams Americans know the art of looking happy even if we are not. Most Russians don’t labor under that pressure. A couple of years after the 9-11 attacks a Russian friend came to visit. She noticed, among other things, how many American flags were on display. She opined that such patriotism was no longer seen in Russia. She admired our display of flags; but I could see a grief as well. Her country was no longer Communist—but what was it? Today we walked down to main part of this small Russian city. I saw a lot of Russian flags. I saw a prettier city than fourteen years ago. I saw a prouder city. The town I left is wanting to be patriotic, but people are very uncertain what lies ahead. The foundations seem shaky. People still want to believe in that America they have long loved. But, as one redneck comedian opined, “America is a country founded by geniuses and being run by idiots.” There is a palpable fear we’re losing something. Again, I realize this is a generalization. And I suspect this fear is not as palpable in New York or D.C. But I could be wrong..
My opinion is that my family and I somehow represent the clash of these trajectories: Do people leave America and come to live in Russia simply because they want to? The people I lived around in Greer are scared. The America that is experiencing the cultural and social dissonance of mass killings in what some consider to be the hometown of Mickey Mouse is the America of uncertainty. Leave this country? Ten years ago people would say we’re crazy for moving to Russia from our home in America. The only mocking I heard this time was, “Well, make sure you have a spare bedroom for me—just in case.” If we had a spare bedroom for every American who said that we’d need a Bed and Breakfast the size of the Biltmore House—or for my Russian friends — Catherine’s Palace. But Russians are generally pessimists. They want to believe in their future and see bright signs, but are a bit afraid to hope. They have experienced far too many disappointments in the past to don the rose colored glasses just yet. People like me and my family, in my opinion, make them wonder. Are we there yet? The arrival in Moscow did not go well. The young lady who was to issue our boarding passes to St. Petersburg apparently did not have a lot of experience in handling a family of five, especially when three had American passports and two had Russian passports. So she responded with typical apparatchik rudeness. Our boarding passes were stamped for gate 17, but we learned at the last moment that they had changed to gate 14. No one bothered to tell us. I never did like Moscow. The arrival in St. Petersburg went well. I first flew into that airport in 2002. I reflected on that first time as we turned for our approach. It seemed small then, and quite, well, run down. The men’s room was a dirty little room with two leaky toilets. Back then we got off the plane, waited in line to get our passports stamped, then walked down one flight of stairs and picked up our luggage. It was larger the last time I flew out of there in 2008. It had also gone through some nice renovations. When we got off the plane this week, however, I was amazed. It was so much larger and so much nicer. I felt confident I could find my way around without reading signs, but I was wrong. And there were not only escalators but elevators for those of us with children in strollers. There were several pick up locations for baggage and some nice carts for people like us with many suitcases. The entrance hall did not even look the same. Pulkovo is a modern airport. My in-laws drove their small Chevrolet and their friend, Mikhail [not his real name] brought his van to carry our luggage. I was totally convinced there was no way we could get all our luggage in that van and carry Oksana, Marina Grace, and I. Roman and Gabriel were riding with the grandparents. Russians are quite innovative, however, and really do not care how silly it looks to stack luggage EVERYWHERE. They got it all in. We were off to Luga. The week before we left America I remember telling Oksana that roads in our country had gotten so awful they reminded me of Russian roads. They are pathetic compared to how things used to be. Again, memories came back as we pulled onto the highway to head for Luga. I remember thinking that the first time I was on that road I had never seen so many potholes and rough spots. Not this time. The road was wide and smooth. Construction and resurfacing were still going on, but the straight road had few bumps and no potholes to speak of. The contrast was stark. American roads leading out my small town have been neglected and stand in great need of repair. How odd that the road to Luga was so nice. The downside is that with such a wide and smooth two lane road, Russian drivers cannot resist “creating” a third middle lane for passing. The roads in Russia were so different; the drivers were the same! For some reason even with a clear passing lane, Mikhail still liked the challenge of tailgating the trucks in front of him (two feet away!) before passing. Then lurching back in front of the vehicles he passed. Mikhail likes to talk. And I wanted to hear what he thought. He’s a retired Army guy like my father-in-law. He asked immediately why in the world a family living in America would come to Russia. We explained that life in America is not as easy as it may appear. Even with a good salary it takes a lot for a single income family of five to make it. And our culture is changing and is more divided. That was enough to get him started. He launched into his own evaluation of things—and I wanted to know what an average Russian guy like Mikhail is thinking of international issues. Of course, he barely paused for Oksana to interpret. I could follow the gist of the conversation, but she had to fill in details later. So my quotes below may not be exact. He had no time for bothersome things like interpretation or questions. He is happy with Putin’s leadership. The country is improving, he said, and the sanctions have actually helped. Russia is becoming more self-reliant. As we rode along I could see his point. I saw houses being built. I never saw that in Russia before—not on the way to Luga. People still lived in the old Soviet apartments. All the houses I had seen were old wooden structures built before electricity. Most had out-houses not bathrooms. But now I saw new homes AND new apartments going up. I saw a billboard that said (in Russian, of course), “We Build Homes!” It was a construction company with phone numbers and names. I commented to Mikhail that I found the roads very nice and the number of homes going up shocking. He said that yes things were much better now. He went into detail about how they are building nice homes that stay warm now. That wasn’t just his opinion. I could see the difference clearly before my eyes. When we drove through Luga I saw the same stores I had seen before, but on the outskirts there were some new larger stores. There were still some shabby kiosks, but most stores and buildings downtown had been painted. And, yes, the graffiti artists were obviously trying hard to keep up! It simply looked cleaner to me than I remembered. Again, however, the Russian drivers kept me from focusing. They drive crazy in town as well. On the way in our little one, Marina Grace, screamed to be out of the car seat. We finally relented when we thought we were safe. We asked what the fine/bribe would be if we were stopped. Bribes were just part of life when I lived in Russia. I would tell those who talked about learning a few Russian words if they visited there, “Don’t bother with пожалуйста (“please”) or спасибо (“thank you”). Learn, “Мы можем договориться?” (“Can we come to an agreement?”), but the non-literal, real meaning is, “How much is the bribe?” Mikhail said there are far fewer bribes now. There have been salary increases for law enforcement, which means they do not have to collect bribes to survive. Before the system was essentially the local government paid law enforcement officers very small salaries. They knew that they could make up for it in bribes. Putin is committed to changing the culture of bribery. When we drove toward my in-laws apartment the road was not as good—but it was paved. In fact, I noticed that there were far fewer dirt roads just outside of town. When we pulled in the parking lot I was, again, greatly surprised. The parking lot was almost full! When I was here before most Russians used public transportation. To have your own car was not odd, but it was not standard for sure. And not just more cars. We’re talking Toyota SUVs, new Fords and Chevrolets, and at least one Escalade as well. My arrival went far differently than I expected. I knew there would be changes, but nice roads? Freshly painted buildings? New and nice cars in the parking lots? Wasn’t on my radar. I don’t think I want to try to answer Mikhail’s question right now. I am not a political commentator. I’m not an economist. I can’t quote the GDP or the current inflation rate or any similar data. 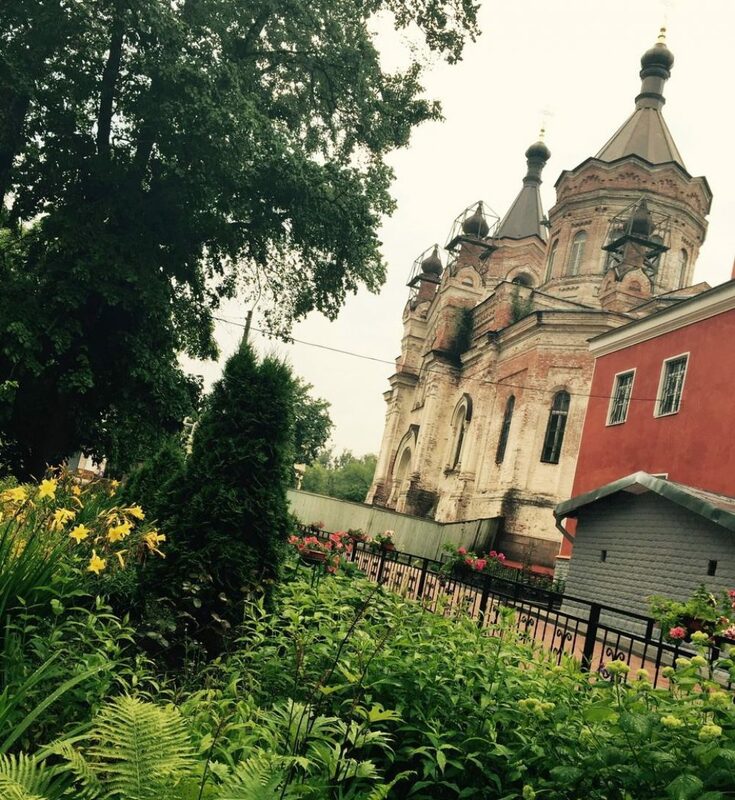 This blog is about one small town in Russia. Roads are better there now; business is better; salaries for law enforcement and construction workers are up. My hunch is this phenomenon is not limited to Luga. The Russian president would not be getting the approval ratings he is currently getting in almost all the polls if this were just anecdotal. Clearly, the dream of so many American politicians that economic sanctions are bringing Russia to its knees is going unfulfilled—despite what their sympathetic American press keeps reporting. In summary, my arrival in Russia indicates things are going pretty well.